This weekend Ed joked that whenever we hang out with the NYC Truckers, we wind up eating at places with big plates and small food. The fancy schmancy joints. He's right. And we like it that way. But if the places aren't the big-plate-small-food-expensive type, they're eclectic, ethnic, or unique. This weekend we went the eclectic, ethnic and unique route. I've told you about Garage Bar, I've mentioned Wild Eggs (which Ed went to once with me and once with MacGyver! 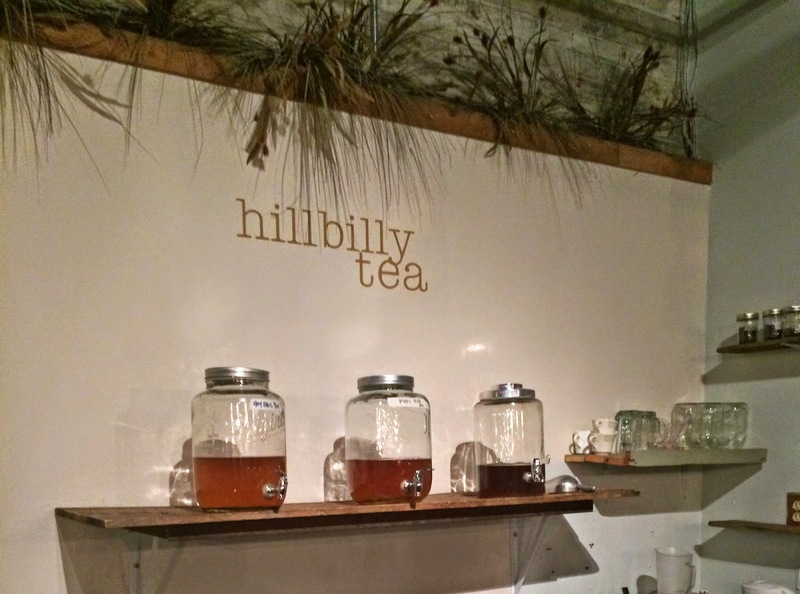 ), and now I'm going to tell you about Hillbilly Tea. 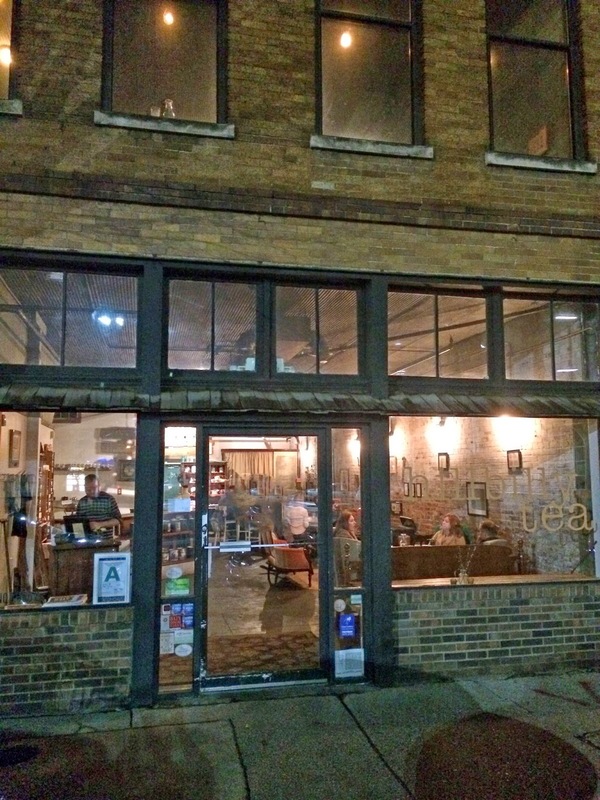 Hillbilly Tea is housed in an old, two-story, brick building in downtown Louisville. It's the first place that MacGyver and I exclaimed, almost in unison, "I'd totally live here!". The second place was Garage Bar. You enter Hillbilly Tea at street level where you find several small seating areas, restrooms, tins of tea for sale, what appeared to be an area where bakery items are sold - probably during the day, and the kitchen. The dining room was upstairs. 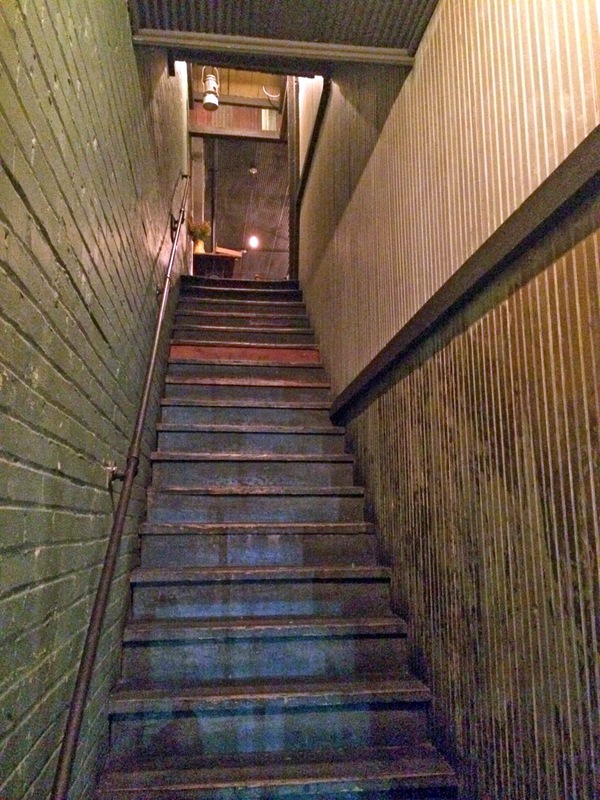 I don't envy those servers, climbing stairs with trays of food. They had tea (iced and hot), and we had it. They had hillbilly food (trout, short ribs, pork chops), and we had it. 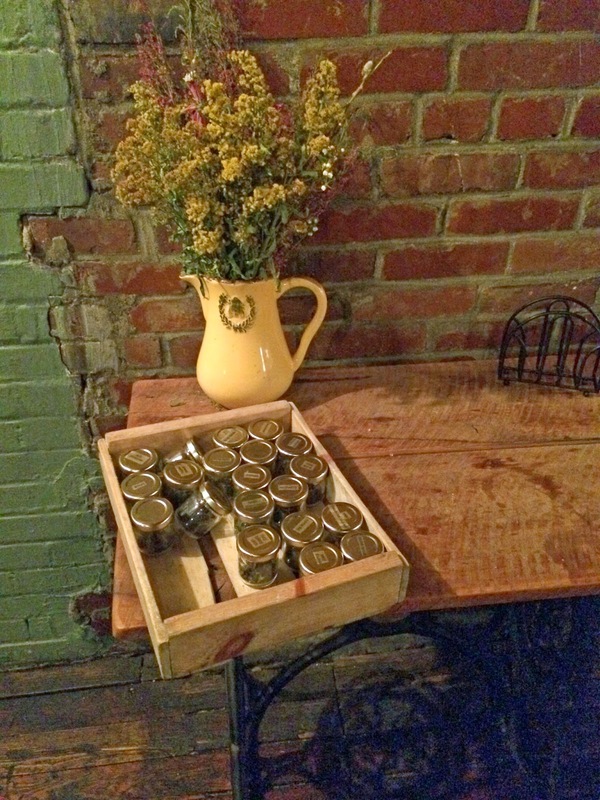 And they also had moonshine. And we had that. And by we, I mean the boys. I got buzzed off the fumes. I'd definitely try this place again. And next time I'll use my real camera, not my camera phone and get y'all some better pictures than these. 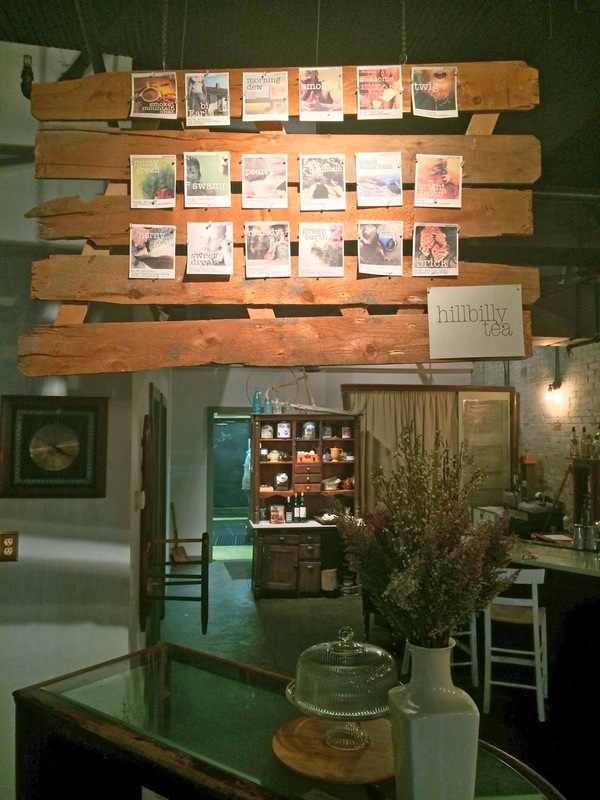 If you can't make it to Kentucky, you can buy their tea online. Little Jerusalem Cafe: Hidden in the back of a drab little strip mall in the Beechmont section of Louisville, and fairly difficult to find, this place was worth the hunt. The owner, Sami Barghoti, treats his customers to authentic Palestinian food and after my first ever bite of falafel, I have to say I was sold. The place doesn't have a whole lot of pizzazz decor-wise, but the restaurant was clean, the staff was attentive, and the food made up for anything I felt was lacking aesthetically. Mussel and Burger Bar: Absolutely dee-lish-ous! I'd go back there right now if I could. The burgers are 100% Black Angus beef and they grind their own meat. I had the Spanish Blue ($14) - La Peral Spanish blue cheese, pepper crest, fig marmalade - served with sweet potato fries with a smoked pineapple dipping sauce. Ed and MacGyver has the La Frita Cubana ($14) - Spanish Chorizo, Manchengo Cheese, crispy Serrano ham, confit tomatoes, baby arugula, caramelized onions, crispy potatoes - they also had the sweet potato fries. Marlaina took the classic route with Good Ole ($12) - Cheddar cheese, red onions, tomato, Boston lettuce, pretzel bun - servied with pomme frites. They have other menu items also, and as the name suggests, they also serve mussels. Fresh from Prince Edward Island, Canada. I like what Louisville has to offer. They have some really great restaurants, beautiful homes, a decent amount of culture, the Kentucky Derby, and if you're following the March Madness madness, two big deal basketball rivals. We will keep coming back - to see trucks and to eat. You should too. 9- Quick, clean, and definitely information a step up from your standard Pizza Hut or Domino's. There's also a nice selection of pastas and salads to go along with the pizzas. Pizza delicious! Phone service much better. Our Pizza place. However, can there be a vegetarian/vegan ingredients :) would very much would appreciate it…. Quality products available here the ancient Chinese used Matcha Sensation to treat whole host of conditions including anxiety, a high fever and inflammation throughout the body. Nowadays matcha is used to treat various ailments and it also coveted for its ability to enhance focus and concentration and alleviate fatigue.